Around 11: 30 pm it's time to push. Seriously?! I am exhausted!!! For the next two hours I try to push Marlie out, but she won't budge. Something is wrong! Every time I push hard, her heart rate drops precipitously low. The midwife and birthing assistant try to get her into position by massaging my womb. It doesn't work. The midwife tells Damon that the baby is in distress and we need to be transported to the hospital. My heart sinks. We pack up and head to the hospital, which is only a block away. I ride with the midwife while Damon follows behind in the car. On the way, the midwife is consoling me. She tells me that the OB will try to perform a vaginal birth, that she might offer me an epidural, that I should take it because I am exhausted and it will help me. I start to cry. I feel defeated because I believe an epidural will lead to a Cesarean and end my dreams of a natural birth. My daughter is born at 1:46 am on August 15th. She comes out kicking and crying...6 lbs, 1 oz. and 19 inches of God's amazing grace! She is handed to me for skin-to-skin contact and she latched on right away. She nurses while Dr. L sutures me (yep, I tore...right down the middle). 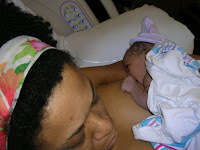 Things didn't go exactly according to plan, but we got our happy ending...a healthy baby and a natural birth! Later than morning, I awoke to Damon playing Marlie's Mix, a playlist of songs that we compiled to celebrate her birth. I sat up in the bed, took my daughter in my arms, and listened to each song. I remembered why I chose each song and was amazed how they all fit so perfectly. I added the playlist to the blog under the About Us section. Take a listen! ahhhhhhhhhhhhhhh! it was ALL WORTH IT! WASN'T IT? What a blessing! Wow! What a story! I'm glad your midwife was cautious. My friend's was not so and didn't get her to the hospital in time. The baby lived, but has major problems still, ten years later. Two of mine had the cord on their necks (actually one was just being compressed by her shoulder and my pelvis). It was touch and go as far as them thinking I'd need a c-section. Fortunately, I am a fast birther and pushed them out with two pushes each. They were both blue at birth though and did not get good Apgar scores. My eldest has Asperger's and I've always wondered if his birth contributed to it... Aren't I a barrel of fun and happiness today? Wow! With both of my kids their heart rates dropped and it was very scary. A great big happy ending tough, YAY! I just love all the pictures you have shared. It helps to make it more 'real' to me and makes me feel more like I was there in a way. You were most definitely a GORGEOUS mother-to-be and I bet not one single thing has changed! Please keep snapping those pictures so we can watch as LMM starts doing all her 'firsts'. OK? Do you have a baby book to keep a record of everything in? That is one of the things I am so grateful that I kept up with (for the most part!) for all three of my girls. It is fun to go back and see when and how they did what. You think you will never forget, but you do! Well, friend, I hope you are obeying and getting lots of rest this week. Please give Little Miss Marlie a big smooch from her bestest cyber aunt! See you again soon. Thanks for sharing your story! Your daughter is absolutely beautiful!